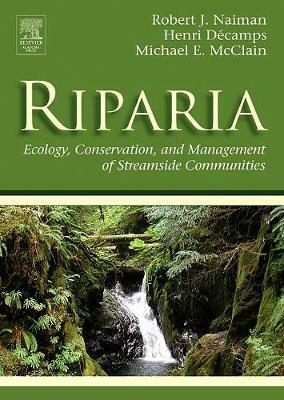 This book describes the underlying water conditions and geologies that support viable riparia, illustrates the ecological characteristics of riparia, and discusses how riparia are used by human cultures as well as how riparia can be used to sustain environmental quality. In recent years riparian management has been widely implemented as a means of improving fisheries, water quality, and habitat for endangered species. This book provides the basic knowledge necessary to implement successful, long-term management and rehabilitation programs. "...i>Riparia is presently the bible of riparian systems, and for that, the authors are owed our thanks..."
"...the most comprehensive synthesis of the riparian ecology literature...researchers and practitioners will benefit from the book's holistic vision of riparia...Highly recommended." "...The authors' capacity to summarize and integrate very different research subfileds accurately and insightfully is an extraordinary feature of this book." "The book is logically organized...This book is exceptionally illustrated with instructive, high-quality photographs and colorful figures." Research Interests:Structure and dynamics of lotic ecosystems, landscape ecology, and the role of large animals in influencing ecosystem dynamics.Professional Appointments: - 1988-present: Professor, College of Ocean and Fishery Sciences and College of Forest Resources, University of Washington - 1993-present: Faculty Affiliate, Division of Biological Sciences, The University of Montana - 2001-2002: Sabbatical Fellow, National Center for Ecological Analysis and Syntheses (NCEAS), University of California, Santa Barbara and The Ecosystem Center, Woods Hole, MA - 1988-1996: Director, Center for Streamside Studies, University of Washington - 1995: Visiting Professor, University of Witwatersrand, South Africa - 1985-1988: Director, Center for Water and the Environment, Natural Resources Research Institute, University of Minnesota; Professor, Department of Fisheries and WIldlife, and the Department of Ecology and Behavioral Biology, University of Minnesota - 1978-1985: Director, Matamek Research Program, Woods Hole Oceanographic Institution - 1984, 1988: Visiting Scientist, Centre d'Ecologie, Centre National de la Recherche Scientifique, Toulouse, France - 1983: Visiting Professor, University of Montana - 1977-1978: Assistant Curator, Academy of Natural Sciences of Philadelphia - 1976-1977: Research Associate, Oregon State University - 1974-1976: Postdoctoral Fellow, Fisheries Research Board of Canada, Pacific Biological StationProfessional Societies: - American Association for the Advancement of Science - American Society of Limnology and Oceanography - Ecological Society of America - North American Benthological Society - Societas Internationalis LimnologieRecent Committee & Consulting Activity (1986-1999) - National Science Foundation: *Water and Watersheds Panel*Long-term ecological research advisory panel*Ecosystem research advisory panel*Various NSF site reviews*Coordinating committee and chair--various NSF Domain of Research: River Ecology and riparian landscapes.Functions: - Director of the Centre d'Ecologie des Ressources Renouvelables, CNRS Laboratory in Toulouse (1981-1995). - Director of the team "Ecologie des ecosystemes riverains" at the Centre d'Ecologie des Systems Aquatiques Continentaux, CNRS et Universite Toulouse 3 (1995-2001).Present National Responsibility: - President of the "Groupement d'Interet Public: Ecosystemes Forestiers - ECOFOR" (2000- - President of several Scientific Committees at the French Ministry of the Environment.Past International Responsibilities: - President of the Scientific Committee of the programme MAB.UNESCO "Land-Inland Water interface: Research and Management" (1988-1996) - President of the "Internaional Association for Landscape Ecology" (IALE) (1991-1995) - Scientific coordinator of the programmes of the European Commission: 'European River Margins' et 'Floodplain Biodiversity and Restoration'.Organization of the internationa symposia: - "Quels Flueves pour demain?" Ministere de l'Environment et CNRS, Orleans, September 1991. - "World Congress of the International Association for the Landscape Ecology (IALE)," Touslouse, July 1995. - "Eighth International Symposium on Regulated Streams - EISORS," Toulouse, July 2000.Teaching: - University of Toulouse: Aquatic Ecology lectures at the PhD level (1990-1996). - Univresity of Roskilde, Denmark: international seminars at the PhD level 'Landscape ecology and the dynamics of agricultural landscapes' (1997 and 2000). - University de Sao Paulo, Brazil: Landscape Ecology lectures at the PhD level (1998).